Our friend, Ralph Mittman, with Printpost.com, must be a natural LEAN-Thinker. He is using our popular BodyGuardKnife almost every day to cut an entire strip out of the liner. 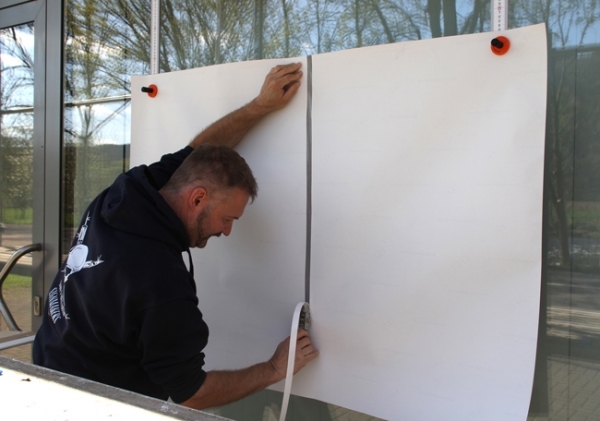 This makes applying digital prints on signs, windows and all upright surfaces a piece of cake. But, until now, he‘s had to make 2 movements to get 1 big strip out of the material. That was a big No-Go for Mr. Mittman, so he simply “married” two glide “feet” to one handle. Now, he was able to make center cuts in just one motion. A perfect “2-in-1” solution, we LOVE it! Great job, Ralph!